From a angling perspective the practical value of spots in an ecosystem can be broken down into a few main components. FIXED – Spots that hold fish at one time will always have the potential to either always hold fish or support populations of fish under select conditions. A spot that held bass in 1920 would be very likely to hold bass in 2010. This has more to do with the fixed position of structure like flats, islands, breaks, markers, underwater humps, shoals and such than anything having to do with calendar dates. MAJOR SHIFT IN THE ECOLOGY – A significant shift in a major element like water quality, water depth, forage or algae (weed growth/types) can create a major changes in the way bass relate to the structure. Water levels rise and fall on Lake St. Clair in a 19 year cycle so spots will have more or less water on them at any given time. This season we have seen spots that haven’t been active for almost 15 years get active again. Other spots that fished strong in the shallow water years you would think fish better with more water over them but that hasn’t always been the case. 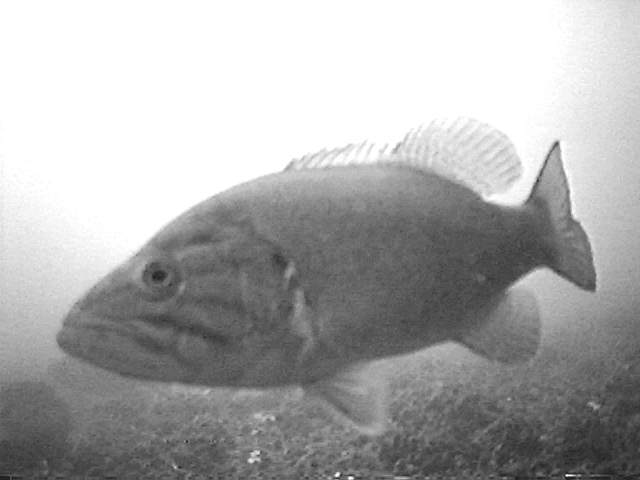 The advent of zebra mussels and gobies have created an explosion of smallmouth bass where back in the day Lake St. Clair was known as big largemouth water. TEMPORARY (Weekly or seasonal) CONDITIONS – The mayfly hatch would be one such temporary condition which cause bass to feed differently during that period. Some “spots” that typically hold fish that can be caught with conventional presentations can seem empty. By changing tactics and chasing the mayfly bite other patterns can be worked until the hatch period is over and those spots reload with summer bite fish. The normal cycles of pre-spawn, spawn, post-spawn, summer bite, fall transition and fall patterns affect how bass position on spots. One particular spot could be hot in the spring and fall but not so much in the summer. Another might only hold summer bass yet another may only hold pre-spawn bass. 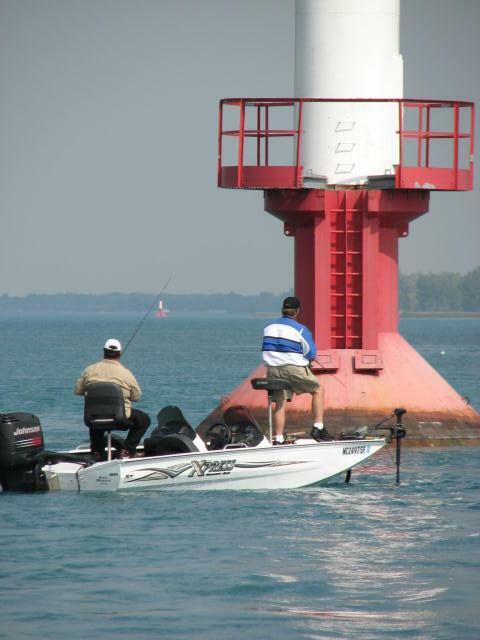 An answer to monitoring the current levels of bass activity across the St. Clair River, St. Clair River Channels, Lake St. Clair and parts of the Detroit River could be to cover that water a couple of times a week to stay on top of changing conditions. Another option would be to access the Live! information given in Fishing Spot Specs™ and Marked Maps Live!™ Both services provide an overview of the system wherever my staff and I are at and will give you regular access to accurate information you can trust. Fishing Spot Specs – What is the Baseline Water Temp? slow moving water. A base line water temp can be the great equalizer by providing a stable, slow changing water temperature to key on when tracking seasonal bass movements. In the case of Lake St. Clair and Fishing Spot Specs™ reports, the base line water temperature is taken from the Detroit River at the Belle Isle station. While water temperatures drop in the shallows overnight then warm quickly during a sunny day the Belle Isle water temp will remain constant. A steady reading makes the advantage of tracking bass movements through temperature more of a science than an art. You can go back into your log book, find a similar water temperature and the spots that were hot during that time period and come very close to duplicating the results years later. This saves time, saves gas and keeps you on the best quality bass available. Expectations are always high for opening day on Lake St. Clair each year yet the conditions are never the same. If you’re preparing to fish a tournament you are looking for pieces of information to hang on to, something to indicate that a certain bite pattern will be “on” or even information that takes spots out of play. Some good news at this point (Wednesday) is that there isn’t anything in the weather forecast that would put the breaks on a normal seasonal transition from post-spawn to summer bite. This is a huge help for taking pre-fishing results and applying them to the tournament or when putting together a plan from scratch. Wednesday: W wind around 18 kt. Cloudy, then gradually becoming mostly sunny. Waves around 2 ft.
Tonight: W wind 9 to 16 kt becoming N after midnight. Partly cloudy. Waves around 1 ft.
Thursday: N wind 5 to 8 kt becoming variable and less than 5 kt in the morning. Mostly sunny. Waves around 1 ft.
Thursday Night: Variable winds 5 kt or less. Mostly clear. Waves around 1 ft.
Friday: S wind 5 to 9 kt. Mostly sunny. Waves around 1 ft.
Friday Night: S wind 7 to 9 kt. A chance of showers and thunderstorms. Waves around 1 ft.
Saturday: SW wind 8 to 11 kt. A chance of showers and thunderstorms. Waves around 1 ft.
Saturday Night: SW wind 5 to 9 kt becoming WNW after midnight. Mostly cloudy. Waves around 1 ft.
Sunday: Variable winds less than 5 kt becoming NNW 5 to 8 kt in the morning. Mostly sunny. Waves around 1 ft.
It’s back! You can go to Fishing Spot Specs™ right now and download reports or you can subscribe again to the Lake St. Clair Combat Bass Fishing Weekly Newsletter™ and get it every week for the next 16 weeks of the season. Data is being poured into the Fishing Spot Specs™ database almost daily at this point and you can get the latest area and spot reports each week for $99. Right now the best way to sign up for the newsletter is to call the ‘800 number but I’m working on getting a BUY IT NOW button on my website, hopefully this week. Marked Map™ customers, don’t forget about Marked Maps Live!™. Reports are coming in steady and it can be easy to get a good read on the status of the bass fishing out there quickly before you hit the water. For Marked Map™ customers that subscription is $29.98 and it runs though May 1, 2011. MM customers have been using this service for over a month and staying in touch with the rapid changes in this great fishery. 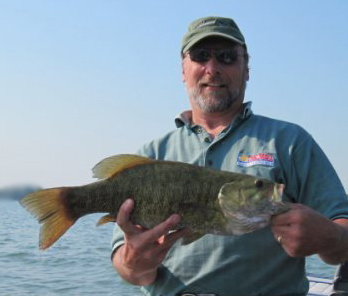 Anglers come from all over the country to fish this world class smallmouth bass fishery called Lake St. Clair. So it’s probably no surprise when a couple of buddies from the area do an early season check on the seaworthiness of their vessel and come up with a boat check that’s OK plus a boat load of smallmouth. We’re they throwing sockets and wrenches out and getting bass back? Not hardly but their experience and skill wasn’t wasted on a fishery that is ready to deliver for those who are prepared. The motto might be something like this: “When you work on your boat don’t forget to bring the tackle.” That seems simple enough. Not bad for a few hours out Jim! Saturday: Variable winds 5 kt or less. Sunny. Waves around 1 ft.
Sunday: Variable winds 5 kt or less. Sunny. Waves around 1 ft.
Memorial Day: SW wind 5 to 11 kt. Showers and thunderstorms likely, mainly after noon. Waves around 1 ft. If you’ve visited Lake St. Clair before during the summer or fall you might want to consider coming this weekend for a completely different experience. It’s one of those times when the changes in the fishery work to our advantage and all that’s left to do is the catching. Oh yes, while you’re at it, invite a friend! If you are a Marked Maps™ owner and Marked Maps Live!™ subscriber click here to log on and see the only spot Chuck and Jim needed to have a great fishing day. It’s posted as Staff99 for May 27th. 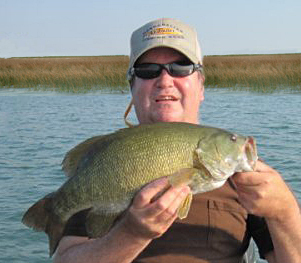 Every fish has its moment where they will bite anything you throw at them yet there seems to me to be something special about smallmouth bass and their propensity to turn off just as fast as they turn on. Tournament anglers work under the pressure of a ticking clock and are most likely to get the broadest look at the phenomenon. The pressure that is on them to produce at the highest possible level during each hour of a tournament produces a kind of tunnel vision toward smallmouth behavior. Different behavior = different bait or presentation. On a macro level bass have semi-predictable seasonal trends which clue us into their position in the ecosystem and what type of bait selection might be the most effective. 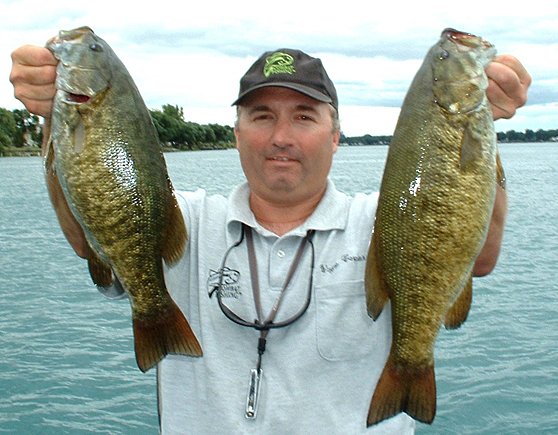 A pre-spawn smallmouth has a wide range of movement and a wide range of appetites. 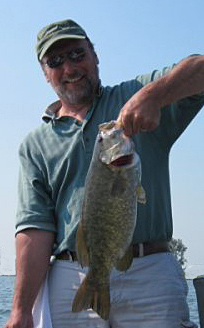 A summer bite smallmouth holds tight to structure and may only bite one style of bait presented in a very specific fashion. In both cases an angler can make good general judgments about where to fish based on very little information. There is probably nothing more fun than just going out with friends and “winging it,” taking stock of “the moment” with each other and accepting whatever a beautiful day on the water will bring. Some anglers though thrive on expanding their knowledge and build on each success or failure then apply that knowledge to a future trip. On a micro level general information is used to isolate tight spots and presentations which then in turn become a strategy or “game plan” for a successful day on the water. So being “in the moment” is that place where every factor that led up to getting on a hot bite comes together. A west wind in the summer with cloudy skies becomes a trip out to a weed flat where you just know they will be waiting for you. A mayfly hatch means that only certain rods and baits come out of the rod locker to press the attack. You catch a nearly undetectable swirl out of the corner of your eye and make a cast to it for a sure hook-up. It’s those moments that keep us coming back for more and it’s the time on the water plus knowledge and information which makes more moments like these possible. For Lake St. Clair, Marked Maps Live!™ and Fishing Spot Specs™ delivers exactly the kind of information that can help make your trip out to the big water the best it can be. Both internet products work side-by-side with laminated Marked Maps, books and downloadable spot specific reports which carry both Live! and historical data. These tools and the knowledge and experience you already have can help to make this the best bass fishing season possible.